Lately, I've been swamped with RL: camping, road trips, new baby on the way, getting car fixed after hit-and-run, getting other car fixed after alternator pooped out (twice! ), new puppy, never-ending work on a new house, etc. 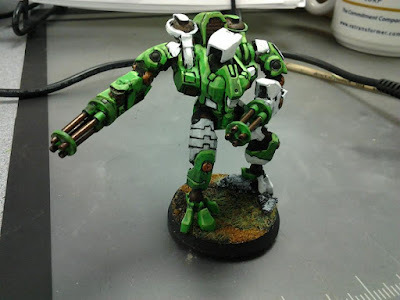 So I haven't been paying much attention to my beloved Tau lately. There is a tournament coming up in September that I hope to attend, but I'm feeling a bit worn down by 40k right now. I think back to 2nd and 3rd edition where a regular game took 1.5-2 hours. Now you are lucky if you can complete a game in 3, which makes tournaments that much crazier as everyone is playing at hyper speed. Tournaments are pretty much all I have time for, since they get me the most game time in a day, but it is exhausting (especially when you are the one running it!). Anyways, enough complaining, time to talk about Kill Team. I organized a Kill Team Campaign for my group which is an ongoing event for us. People play when they can with whoever they can and people can join in whenever. I'm finding it very enjoyable, as the games are more relaxed and they are much shorter. The rules we are using are fan-made and are superior (imo) to GW's version. You can check them out HERE. They have actually stopped official updates for now, so you can hit up their facebook group HERE for continued fan additions, or their official forums HERE. We are using an expansion I wrote called "Port Malad." Here is the team (so far) all together. 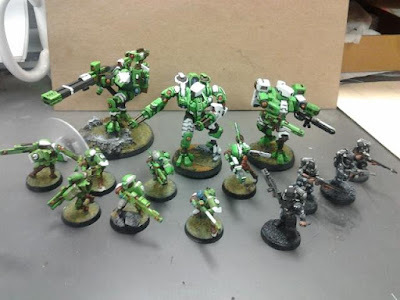 The beauty of the campaign is that the team can grow over time, and I plan to be involved in updating the Tau kill team list after the new codex drops, so it might change then too. The "Warhounds" and "Sly Rodents"
As you can see, I'm not done painting, but the team is mostly complete. I have only completed 2 games thus far, but team "Sundown" has won both of them so far. Something that I don't have (and wish I had room for) is markerlights. Markerlights are awesome in Kill Team but are very hard to fit in when they are competing against things like Broadsides and Crisis suits. Perhaps that can be fixed when the new codex drops and the KT list is re-done. -Command has been given to mission commander Shas’El Bork’an Tak’Hui “Mystery”. The mission is to pave the way for the eminent Tau expansion into the region. “Sundown” is part of a socio-economic experiment of preparing systems for the Greater Good. El’Tak’ui has hired marksmen, combat specialists, and whatever other resources he can get from the local gang to supplement his own team of Shas volunteers. This gang was particularly well established, influential, and located near a nondescript landing platform, hence the choice of platform 12 as the team’s base of operations. -Operation Headquarters: Cargo Manta located on ancillary landing platform 12. Paid off platform operators to list the platform as “under repair” and shut it down for the duration of their mission. -Primary Objective: attacking key features of Hive infrastructure (assassinating/protecting key political figures, destroying resource caches, cutting major power sources, tipping scales in favor of inflammatory gangs, etc.) Teams have been dispatched to two other inter-atmosphere hubs as well. When social and government collapse is eminent, Water Caste delegates will arrive to offer the Greater Good as an alternative to anarchic self destruction. -Secondary Objective: the acquisition and analysis of the rare and unique items that accumulate in Port Malad. Here is the fluff I wrote after the first two games. One was against an Ork player and was the "last stand" mission. Ironically, my Tau were the ones surrounding and attacking an ork camp. Shas'El Bork'an Tak'Hui "Mystery" checked his suit's scan display again. The Be’gel (Orks) were still milling about in the compound, but showed no signs of leaving its protection to head back to their established camp. Based on the intelligence provided by one of the Night Jackal informants, the savages had just finished raiding the Locrean sector of the Hive. El'Tak'Hui knew that sector to be rich with technological artifacts, but he had steered clear of the area for the time being. That area had also attracted the attention of the vaunted "Grey Knights." They were the best Gue’la in the system and El'Tak'Hui still didn't know what they wanted on this small planet; probably some psychic artifact that had found its way here. Engaging them in the tight confines of the Locrean area without further intel would likely be suicide for his task force. The raiding Be’gel, however, seemed to have gotten their hands on several pieces despite the presence of the silver Gue’la. No doubt these trinkets would prove useful for his mission, even if only as bartering chips. This was his chance to take the artifacts from the unsuspecting greenskins before they could regroup and head back to their camp. Weakening the mob further would benefit his primary objective anyways, as the Be’gel would render the Hive useless to the Tau'va if they were given too much leash. And lastly, fluff written to explain my team's absence of late. "Shas'El, I think that there is still more to be learned through observation. By my counsel, we would use this repreive to gain a greater understanding of this gue'city's economics and heirarchy. 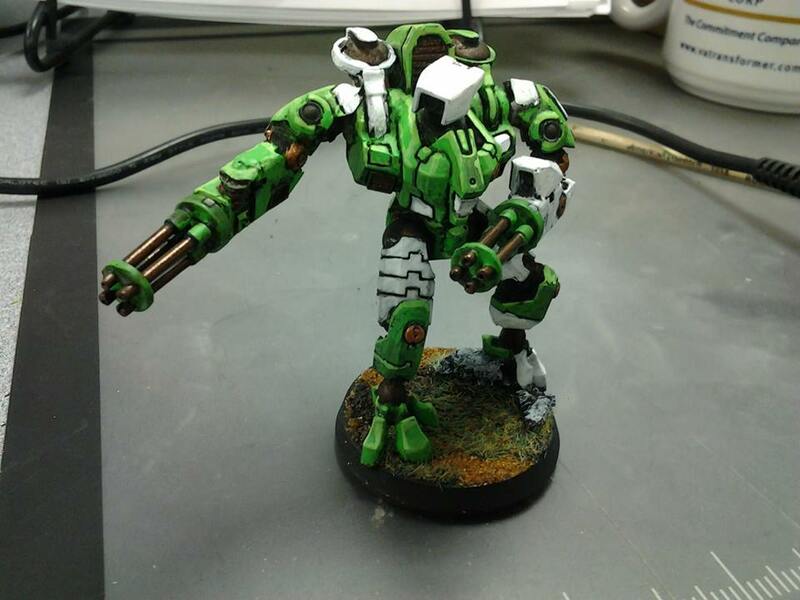 Sundown's mission was not intended to be a full military operation, but a systematic removal of resources, leaving an alliance with the Tau as the only hope for survival." Shas'El Bork'an Tak'Hui folded his arms across his chest. "Wise counsel, as always, Por'vre Hesh'ke. But what shall our enemies be doing while we watch and wait? We have gained a tactical advantage and it would be a crime against my teachings to pass it up." The Por frowned. Counsel discussions between differring caste members often went this way. In the end, the Shas'El had the authority and he would do what he thought best, regardless of the counsel of VreHesh'ke. El'Tak'Hui was an exceptionally stubborn Shas, and even Vre'Hesh'ke's masterful diplomacy skills did little to persuade him. Even so, he would try another tact. "The current military advantage was an inevitable outcome, based on our forecasts and calculations. The unforseen factors are still well within the acceptable variance for threat parameters. If we deviate from the prescribed mission at such an early stage, we can no longer predict the outcome of our mission. Tau'va dictates that we choose the path we know to end in success, lest we risk the lives of every team member due to an early deviation." The grizzled Shas stood in silence for a few rai'kor, sighed, and sat down . "Very well, Por'Vre. We'll do it your way. By the Aun, I long for a straight up fight. These eco-deterioration methods are taxing my spirit." He heard the low whine of a Gue aircraft's engines and looked out over the lower hab's sloping skyline. El'Tak'Hui could see a small cargo ship, barely an inter-atmospheric skiff, descending toward landing platform 12. The unmarked vessel looked like one of their hired smugglers, most likely carrying the reinforcements and resupply that El'Tak'Hui had requisitioned from their home ship. I hope you enjoyed it. This just shows how you can immerse yourself in a small game like Kill Team, and through a campaign you can see your models develop a personality all on their own. For example, I never suspected one of the 'Kroot' to be so proficient in close combat, but the leader model actually killed a Stormboy and ork biker in close combat all by himself. Quite an astounding feat considering how weak the model's stats are. As a reward, I gave him an actual name "Knifehand" to show his ability. The team leader has performed well. 8 pulse shots kills just about anything you shoot at. The Broadside sniper hasn't performed nearly as well (only killed one Ork Flashgit so far), but he is fun and keeps the enemy specials hugging cover. I'm sure I'll be happy to have him at some point. The shield generator makes him that much harder to kill at range but I haven't used it yet since it was my latest purchase. In general, everyone performs as expected, drowning enemies in pulse shots. The plasma is a new addition that I have yet to use. I upgraded my team's base so that I can field all my models in the same game (250 points allowed). I've lost a couple firewarriors as casualties, but I bought them back at the end of the game with my new points. With only two games under my belt, my team hasn't developed tons of skills yet, which makes it a fun time wondering how they will grow over the course of their mission in Port Malad! Thank you for sharing that - we got a great mix of cool models, list building and awesome fluff all in one.